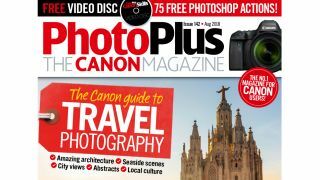 The new edition of PhotoPlus: The Canon Magazine is on sale now (as well as arriving in subscribers' postboxes) and it’s a cracking issue. To celebrate the hot weather and summer holidays, in The Canon Guide to Travel Photography, we’re arming you with the necessary Canon DSLR techniques for taking great shots while on your travels. In the popular Apprentice section, our lucky reader goes full-steam ahead with his train photography with the help of great Canon pro photographer Don Bishop. We also interview award-winning wildlife and documentary pro photographer Jasper Doest, check out his amazing photos taken on a variety of intrepid trips. In our inspirational and informative Canon Skills section there are new photo projects and image-editing tutorials, including how to capture great reflections in your scenes, using a drone with a torch to light a landscape, and mastering GPS on your Canon DSLR. All of them come with accompanying free video guides on the disc – or accessible online and in the digital edition – so you can follow and learn at your own pace. Plus don’t miss all the new skills and solutions in Canon School, and you'll find refreshed tutorials on Canon’s free Digital Photo Professional software.